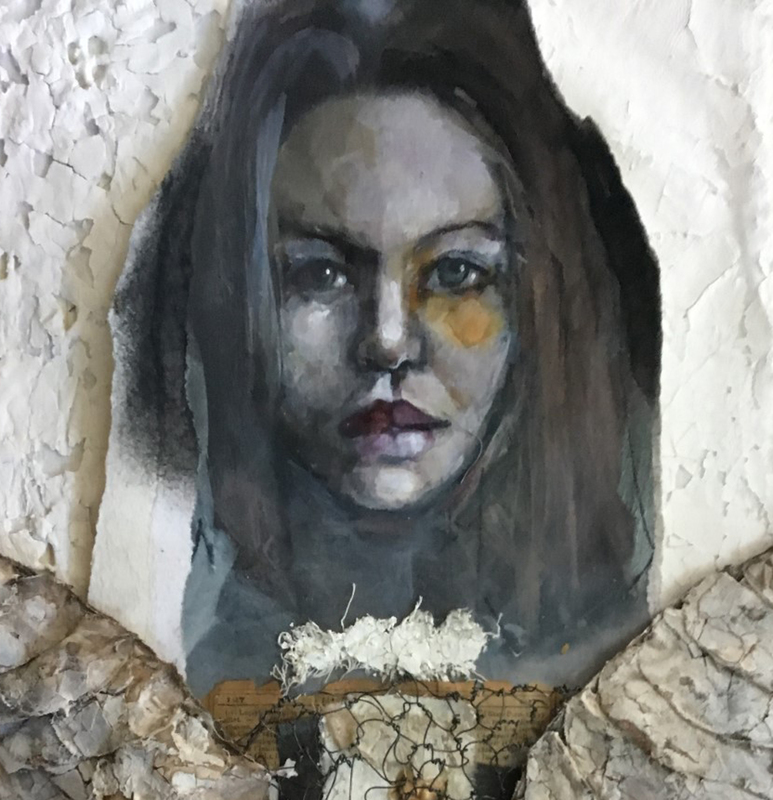 I will teach students how to paint over a collaged face, attach and make plaster fabric wings and create what I call vestments (layers of collaged papers, fabrics and stitching). We will also do a wire weaving element to add to the piece. We will first work on the faces. I will have a collection of images for students to pick from or they can bring their own. Front view is what we will be doing. I will demonstrate with acrylic paints painting over this image to make it look like a painting. More advanced students can sketch and paint their own portraits. 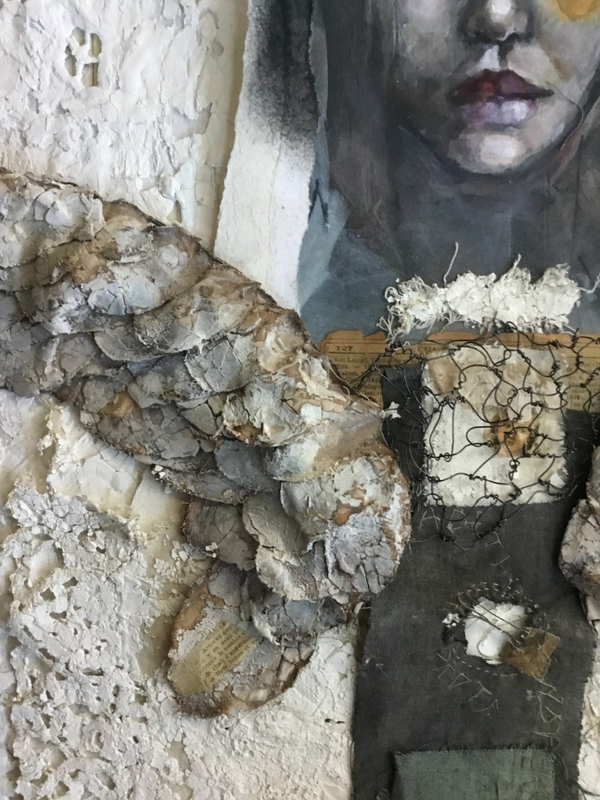 I will also demonstrate how to make the plaster fabric wings. Each student will get plastered fabric and templates to make their wings. 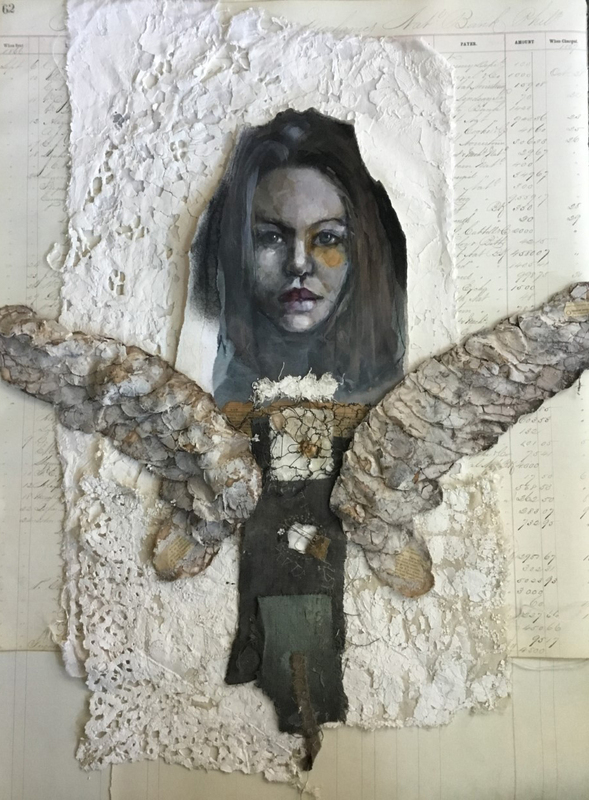 We will create what I call Vestments (layered collage) using papers, fabrics, plastered lace bits and stitching. We will also create a webbed wire to be attached to the wings and on top of the Vestment. I then demonstrate how to make the wire woven piece. The overall size of the piece will be 18" x 24". You will want to mount this piece on a piece of wood you can have cut at a home repair store like Lowes. I suggest you get that when you get home so you can pack lighter. I will demonstrate how I attach it to the wood panel. ACRYLIC PAINTS - (I use Golden Open Acrylics) titanium white, quin. Nickel azo gold, paynes gray, ultramarine blue, alizarin crimson like THIS! 1 piece of linen or linen type fabric for base of vestment (about 4" x 10") and several pieces of vintage linen or raw linen for painting (about 13" x 21"). Look at the vintage and thrift stores to find cheap beautiful vintage fabric. Or check on etsy and ebay for vintage tablecloths or linens.